Rare EarthBound Ruler for Sale! eNot too long after those EarthBound promotional materials were recently auctioned off, a fellow by the name of Starman 99 contacted me and mentioned he happened to have one of the super-rare EarthBound rulers that were also used as promotional items back in 1995. Like the other promo materials from a few weeks ago, this EarthBound ruler was included in a set of promotional stuff sent to people in the press. For more details about the ruler, you can see here. 38 Comments to Rare EarthBound Ruler for Sale! OH YEAH? YOUR BOTH GOING DOWN BECAUSE I HAVE 2000$ TO WASTE ON A RULER OH YEAH! Everyone should probably get out of LucasTizma’s way. I’m deadly serious here. Who thinks this will pass 200 dollars? I think it will pass $200. This is Spa—Eagleland!!! Home of the $14+ BURGER! If this doesn’t go for around $750, it’ll be pretty dang close. Someday, we’ll all have to get all this stuff together and open up an EarthBound museum. Obtaining all of these EB knick-knacks would be too awesome a responsibility for one person. Dangit, naggit, nuggit! I’d so get this if my budget wasn’t so tight! Hmm… Seeing as the ruler has never been on ebay before (afaik), this will almost definitely pass $300, and might even go for double that. After taking another look at this auction, I have to ask, what is the big difference between a new ruler and a used ruler? I’m not really gonna bid on this. I’ll wait for the next EB0-proto to come. Hoo boy, I can’t wait to see how high the bids get on this. Daaaaaaaaaaaang it! I was in contact with this guy to buy it directly, but I’ve been out of town, so I didn’t get his e-mails until now! D: Oh well, I’ll bid on it anyway. 😉 Kinda low of MOTHER-reserved cash after that $500 EB box with promo materials. @Chrissii: Do iiiit! 😀 Mr. Saturn Wars! Its neat to see so many promotional goods show up. I wonder how many the EB community doesn’t know about are still out there to be discovered. I can understand the Mach Pizza Guy Freshener but, I can not comprehend the ruler. 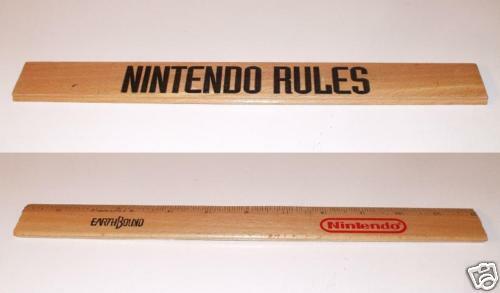 Was a little kid going to buy this game because I got a….RULER! It’s kind of a fail in promotion by itself. I will be very surprised if this sells for more than $200. Daaaamn! $61 for a freaking ruler! The EarthBound community never ceases to amaze me. I am so using this to figure out the length of things easily. Man, I’m surprised I was the top bidder at $61 for almost an entire day! Now you can measure things! Part of me wants to go bid $500 right now and see who outbids me. But the other part of me is scared because someone might not outbid me! Who wants me to record the last 60 seconds of this auction? Hi, I’m the seller of the ruler…it is too late for me to revise the auction, but for whoever winds up winning; I’m going to be incluing an extra item into the package with the ruler. It’s nothing amazing, just a magazine that has a small writeup about Earthbound 64 and has some screenshots of the game as well. I wish I had some other EB items to add in for you guys, but that’s about all she wrote as far as what I have. It’s going to be a instense 5 more minutes! call me the crazy earthbound lady. First of all, that looks cool. Second, Nintendo doesn’t rule. It would if they released EarthBound, Mother, and Mother 3 to America. Third, its just a ruler. What’s with the random e at the beginning of this article? Metal Sonic Gaming: Woah! That’s interesting! FranklinVadge: I ordered my over a year and four months ago… still waiting patiently. mexicanSaucer: I wonder what the role of the Mecha-Drago would have been in this alternate scenario. HONK This site is a personal blog and is not affiliated with Nintendo, Shigesato Itoi, Brownie Brown, or any other companies.